Tubi is a plastic pipe specialist and operations innovator, with the story commencing in 1972. 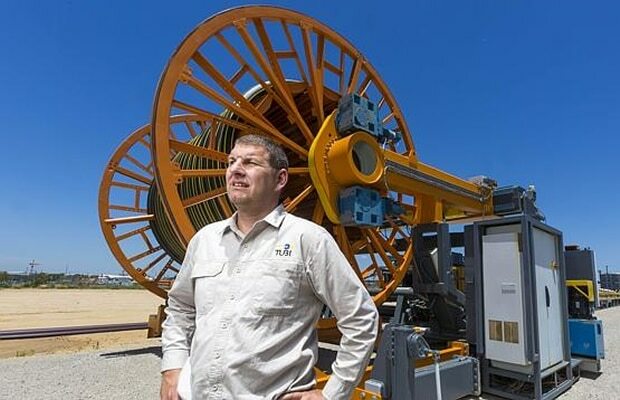 The Government of Australia: Department of Industry, Innovation, Climate Change, Science, Research and Tertiary Education, awards Tubi Pty Ltd with a Commercialisation Australia Project Grant for the on-site manufacture and deployment of a Polyethylene Piping System. technologies, unveiling Tubi Future Pipe Solution, Brisbane, Australia. For the first time in the world Tubi Group Reel and Strung 315mm pipe SDR13.6 successfully. Tubi Group successfully transported pipe drums 300km distance and strung 7km's per day with 9 welds for QGC / PG Group Queensland. Transported existing Mobile Modular Extrusion plant with reeling technology from Australia to New Zealand. New South Wales Australia, where a young and passionate Marcello Russo worked alongside his father Enzo Russo to create many of the raw plastics and pipes that continue to fuel some of Australia’s most powerful companies today. At the Russo family factory a commitment to the pursuit of industry excellence spurned Enzo Russo to develop a globally recognised range of plastics and raw materials manufactured to the highest-quality including High Density Polyethylene Pressure and Non-Pressure Pipes, PVC and Film Extrusions. Today, Tubi’s unique Mobile Modular Extrusion plant and exclusive Tubi Reeling System provides maximum project optimisation at a minimal cost, delivering a world-class product with the guarantee of mobility, exclusivity and flexibility. This patented technology is now responding to broad stream of applications in an expansive and diverse world market.